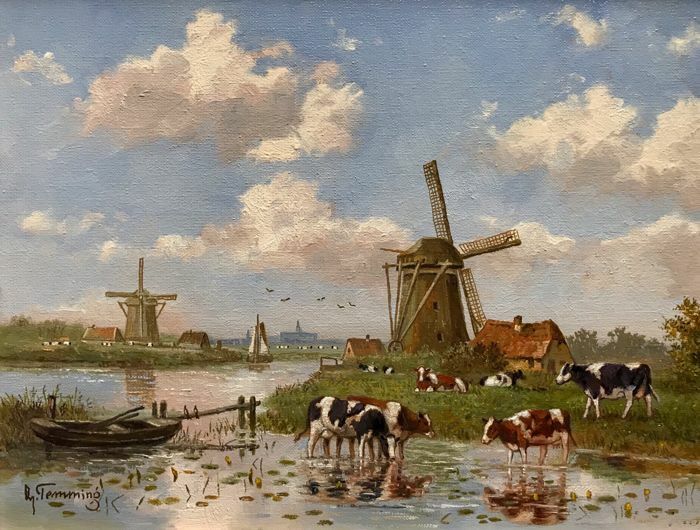 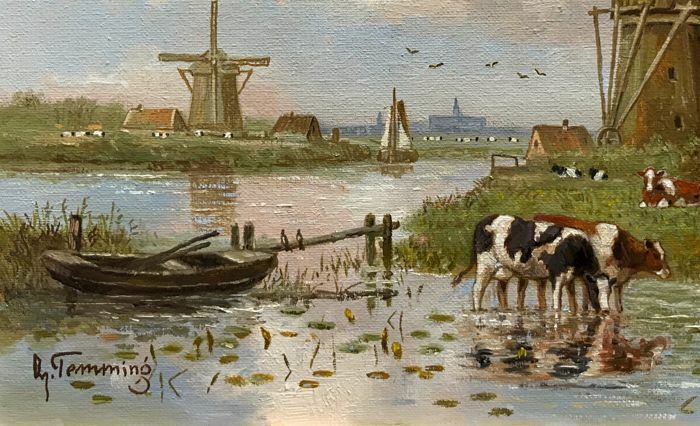 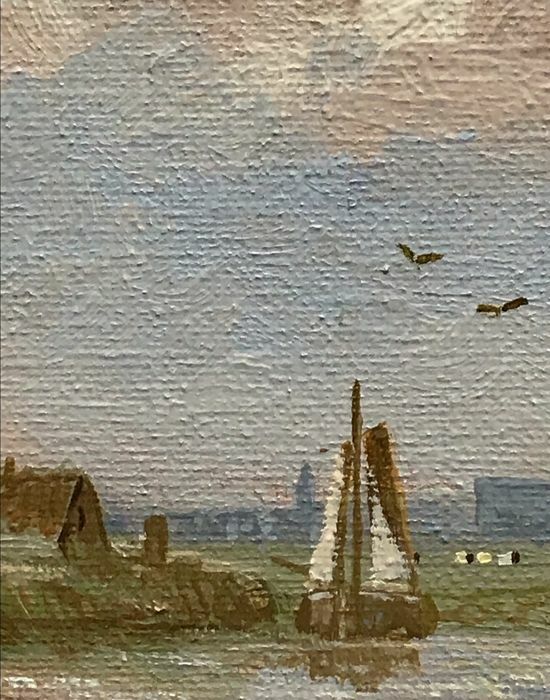 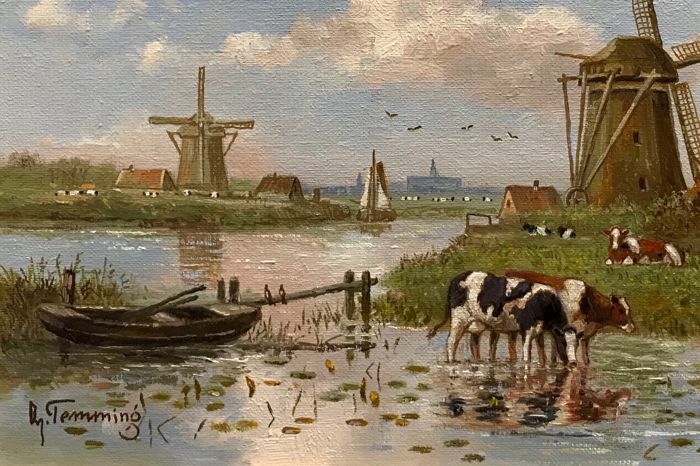 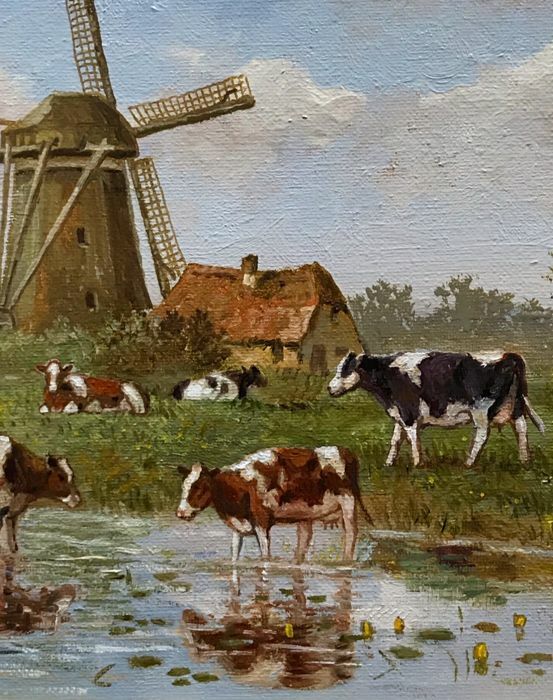 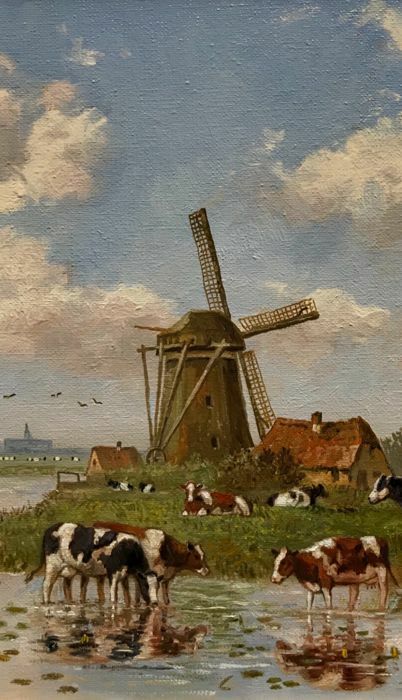 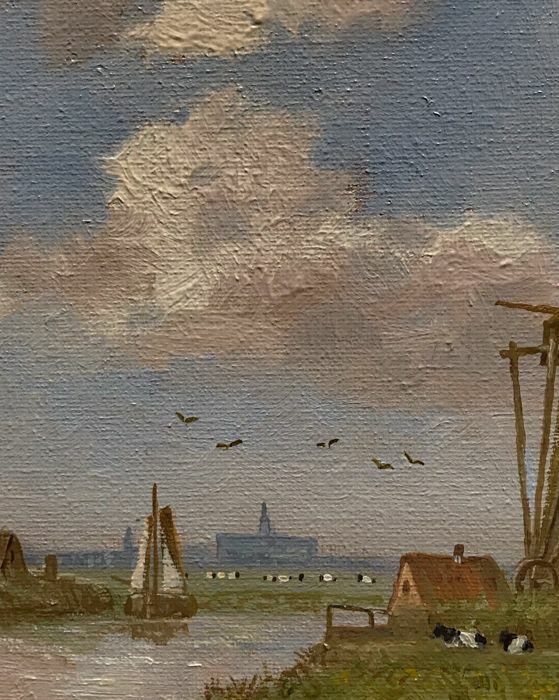 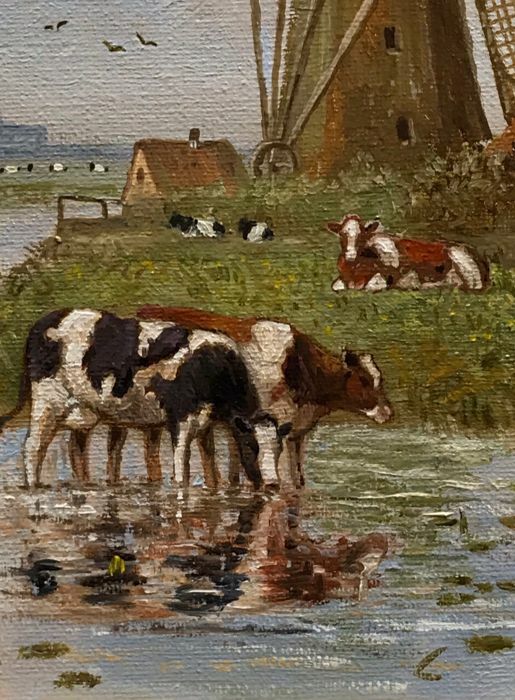 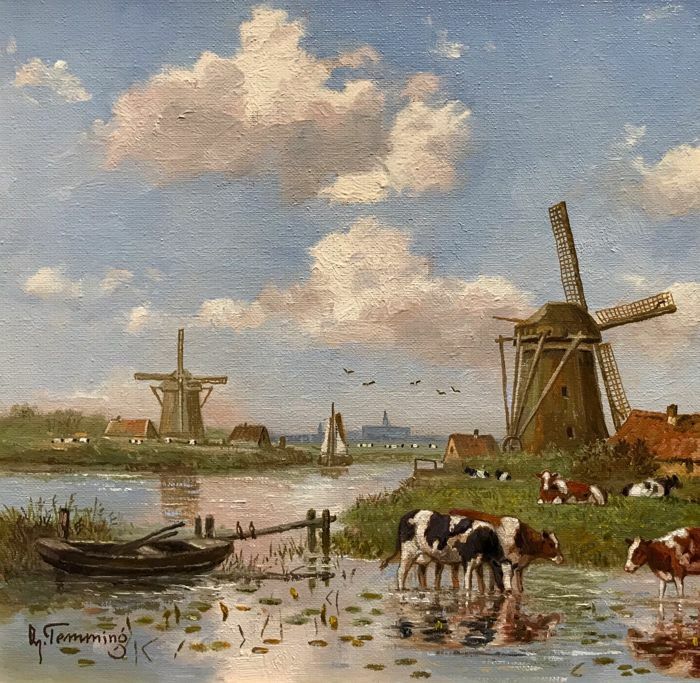 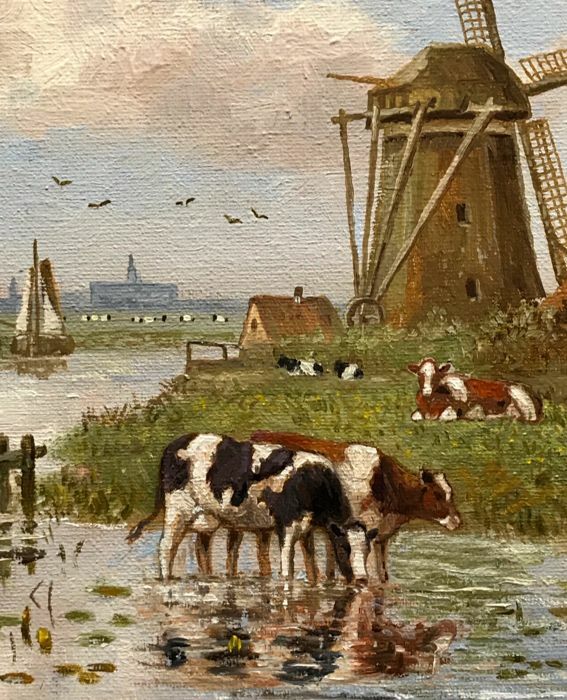 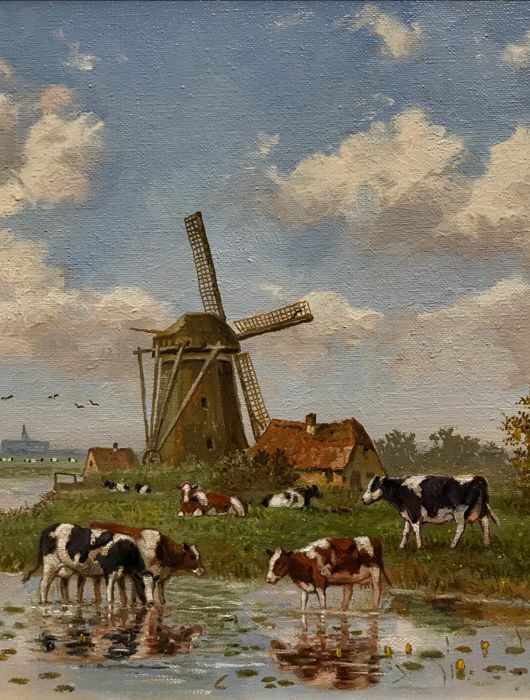 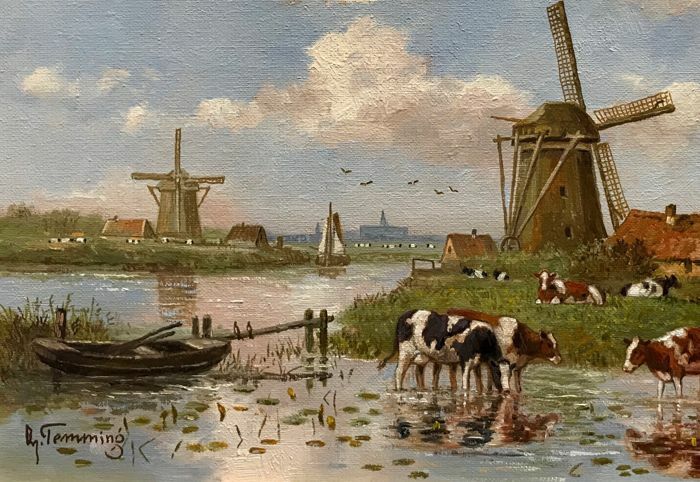 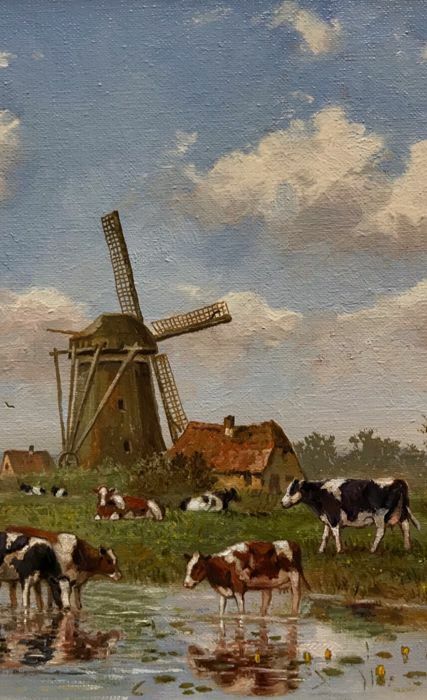 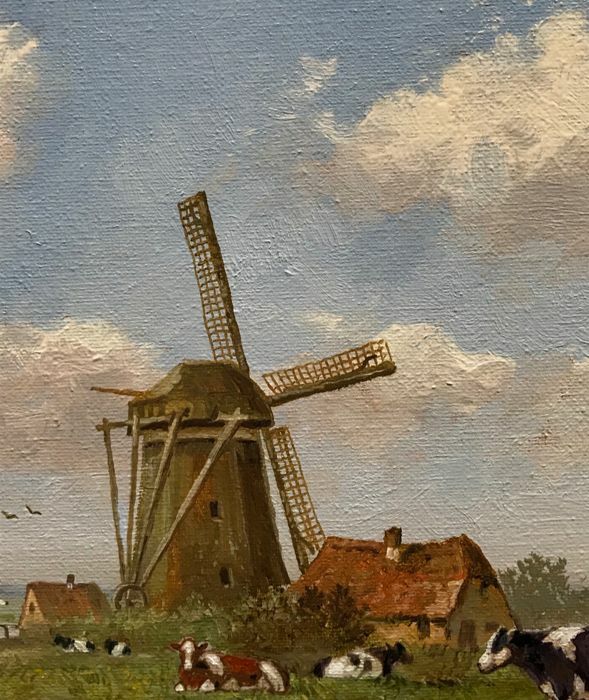 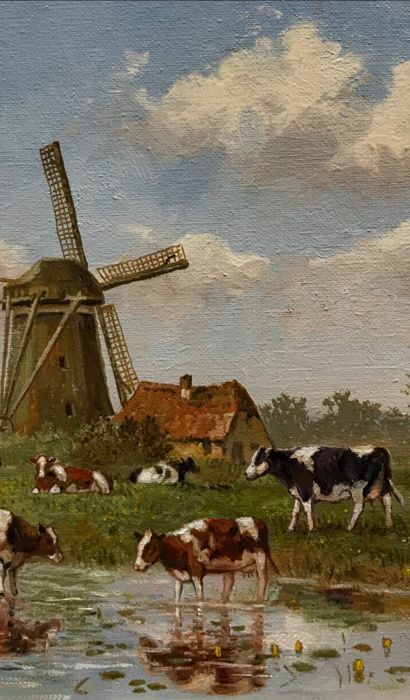 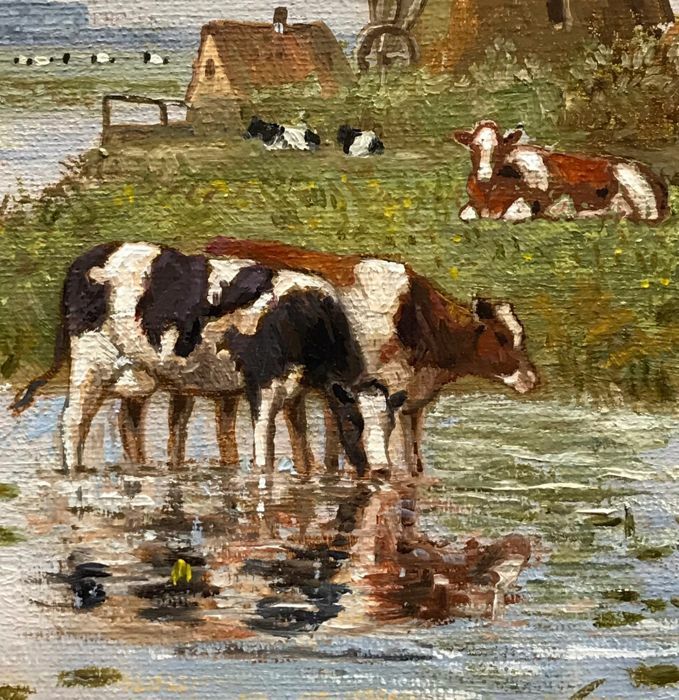 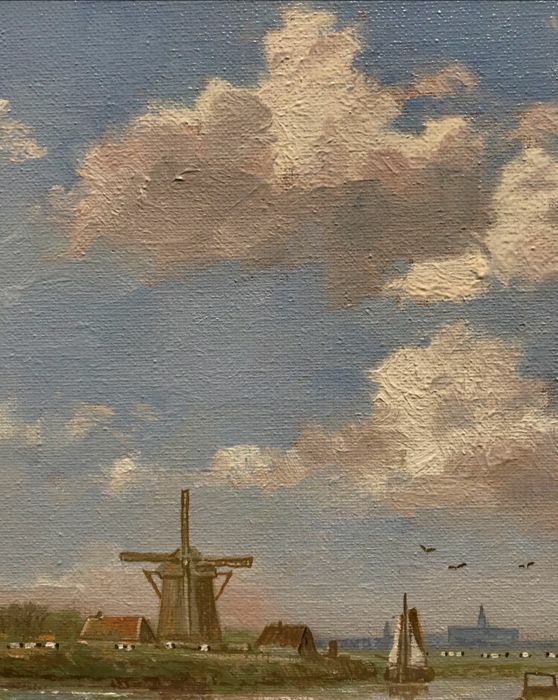 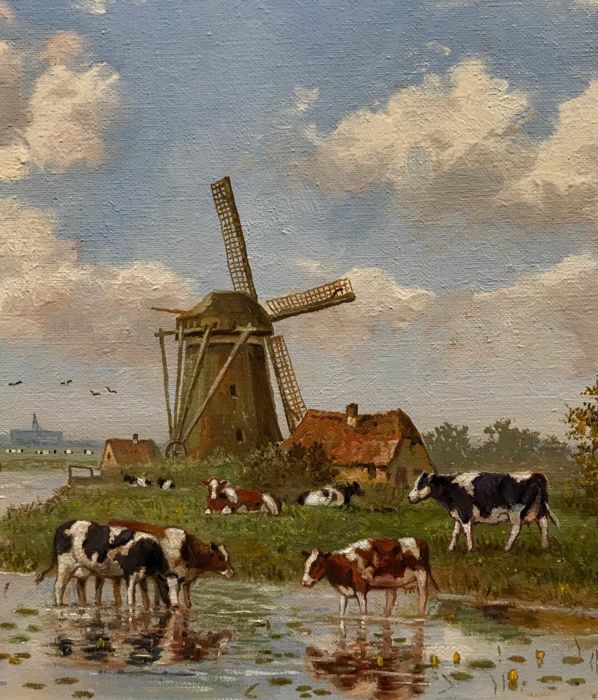 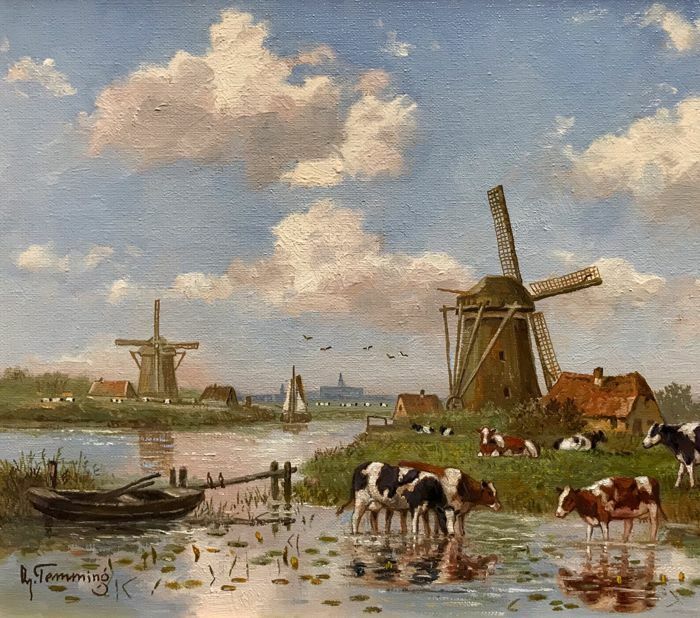 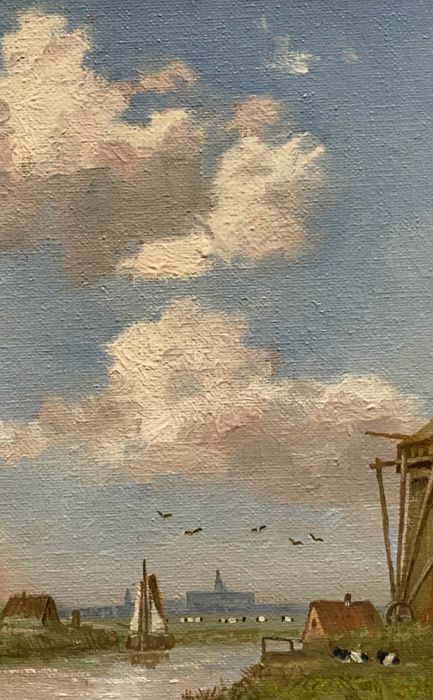 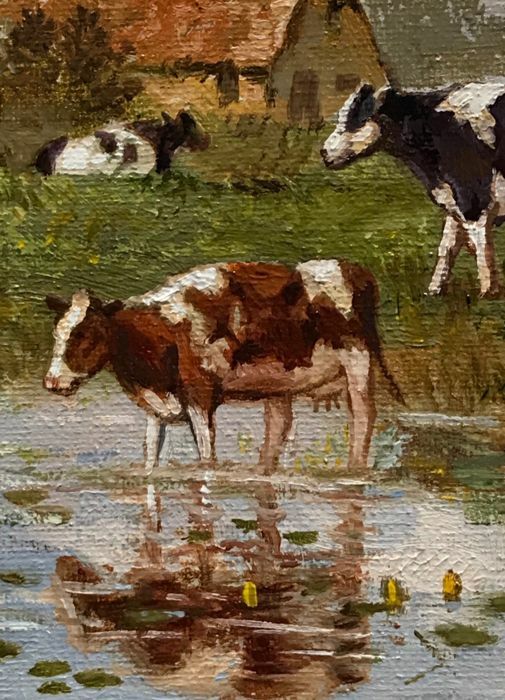 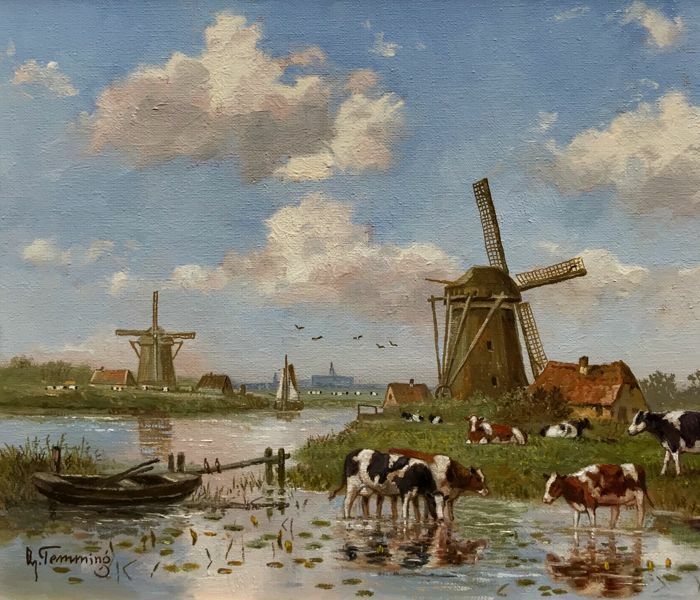 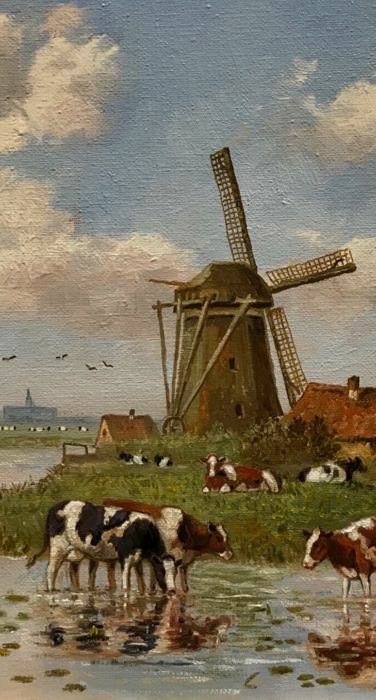 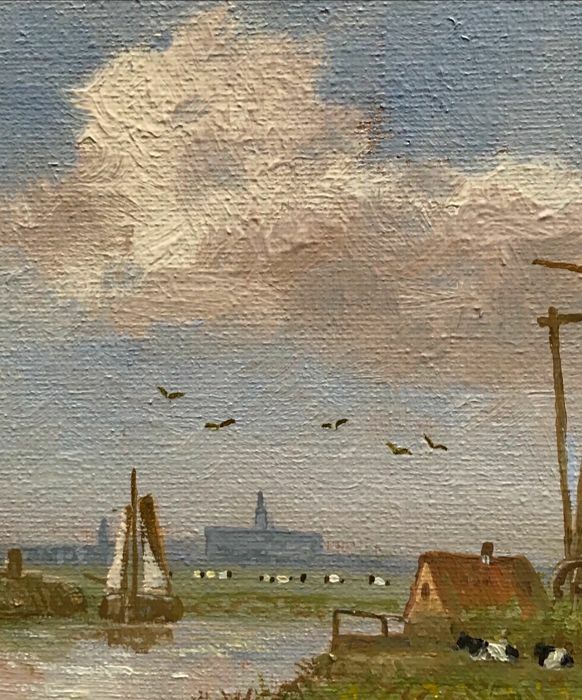 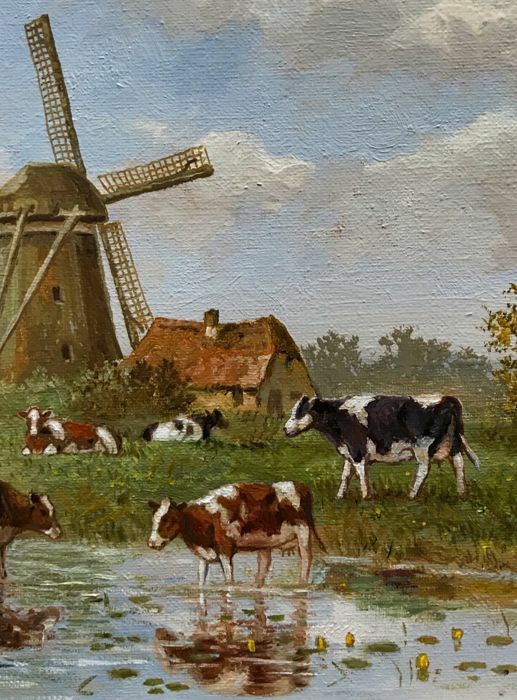 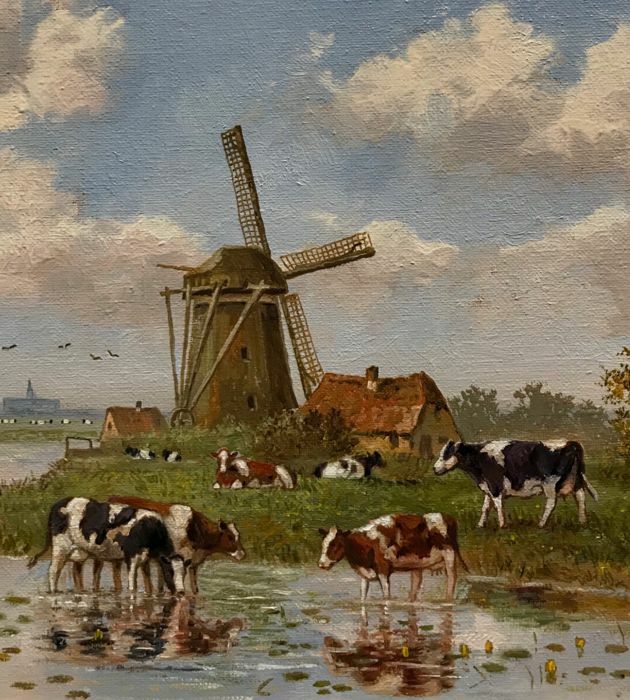 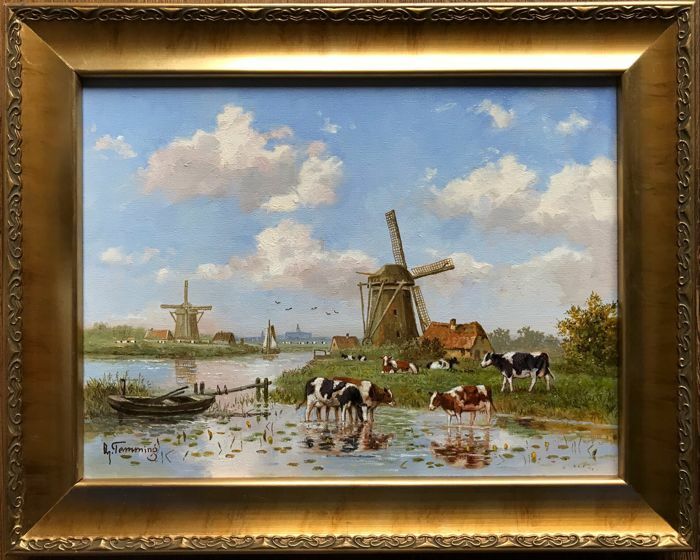 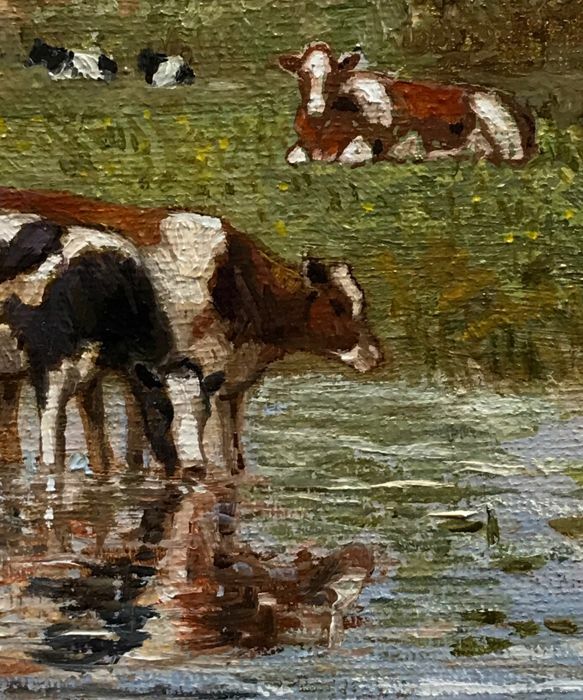 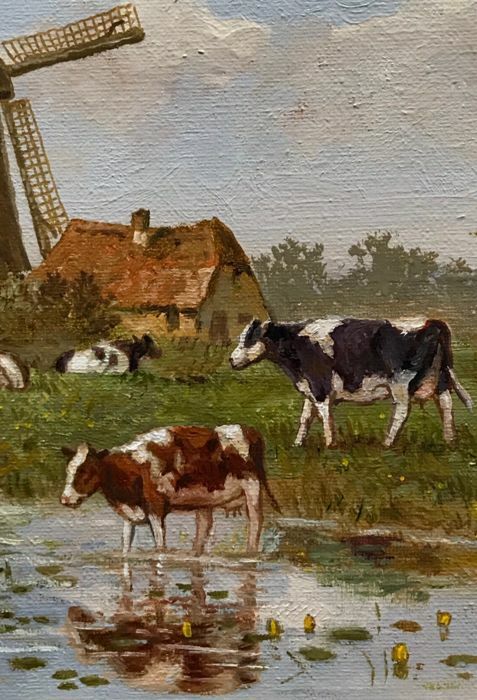 At the request of many of you once again a beautiful copy of Albert Temming's favourite subject: "zijn koetjes” (his cows). 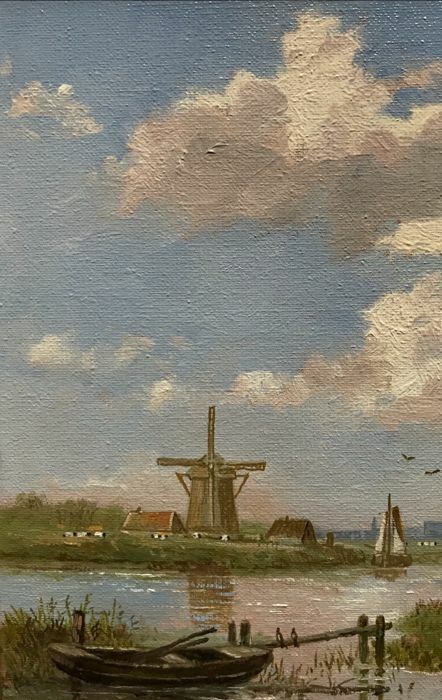 On quality linen, signed in the lower left and on the back. 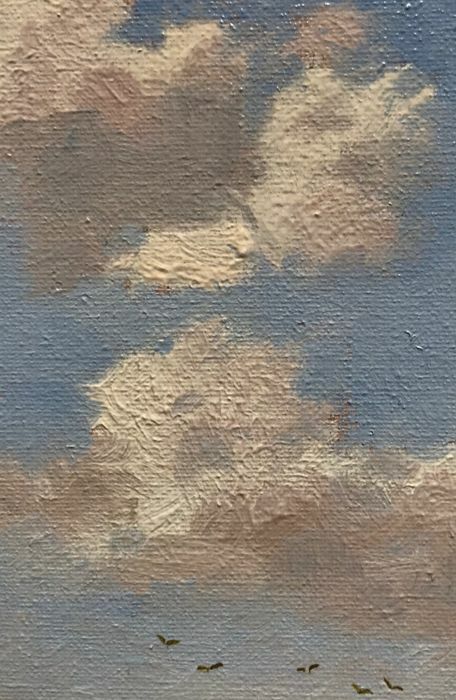 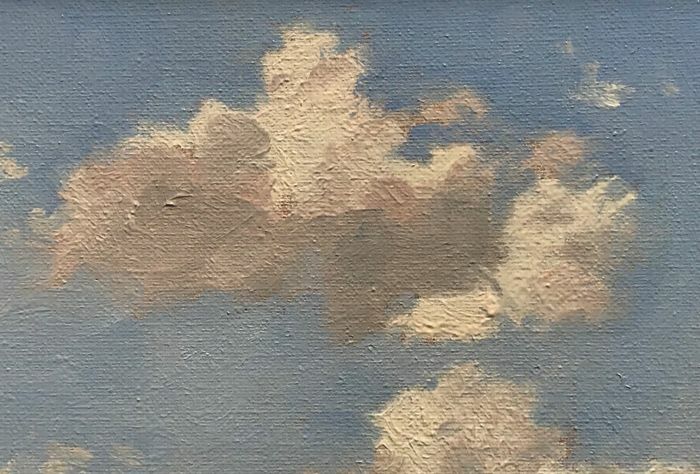 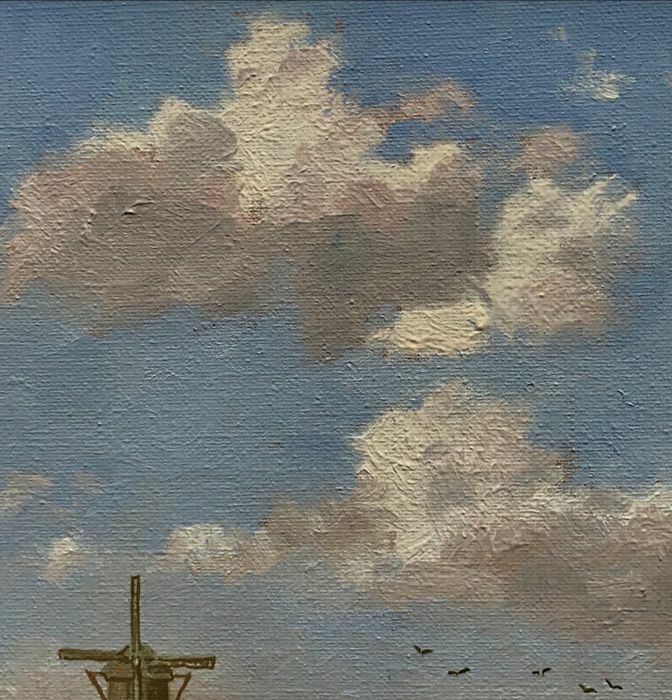 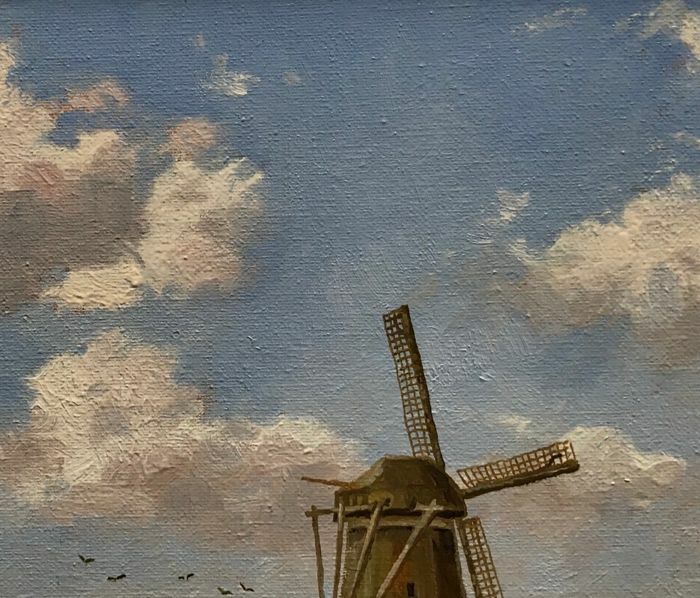 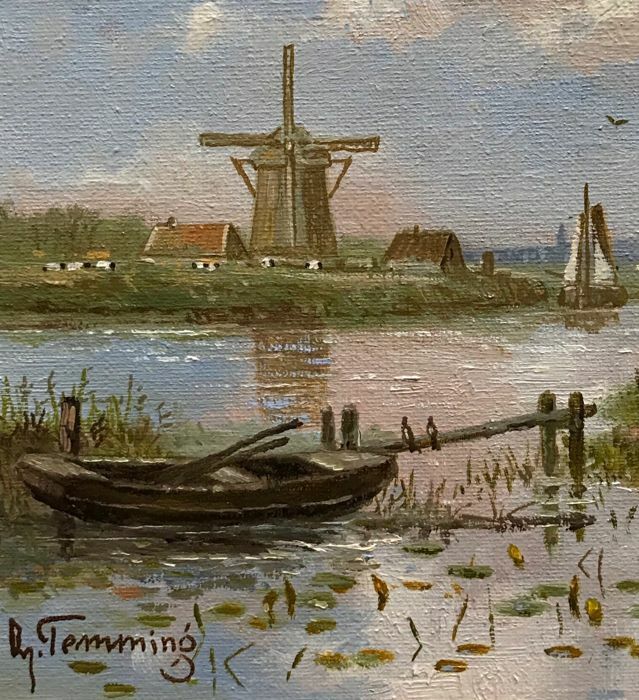 Apart from his always accurate structure, this painting is a great example of the beautiful skies that Mr. Temming mastered like no other. 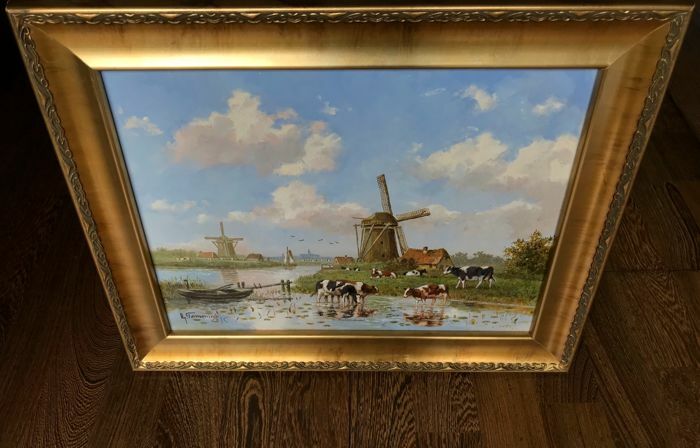 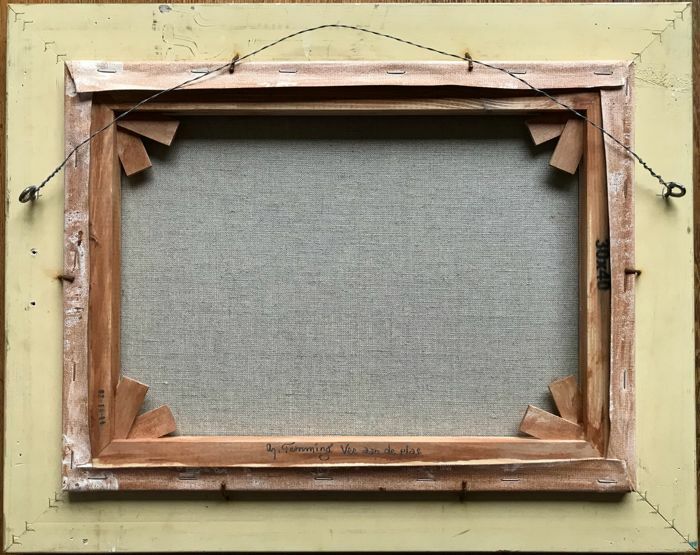 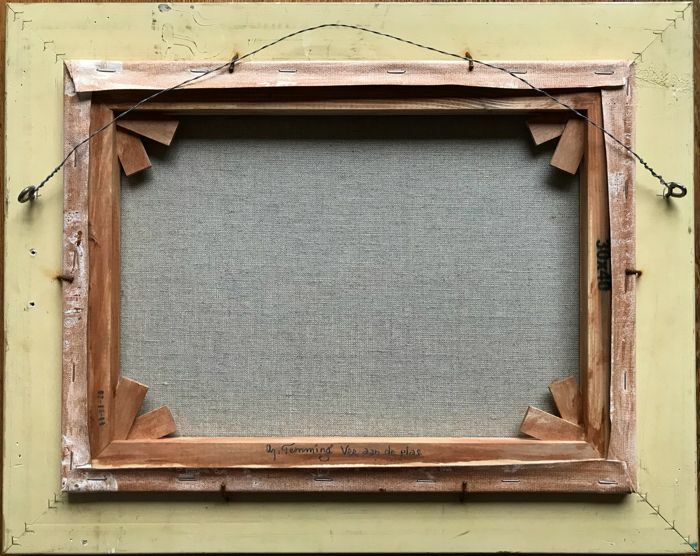 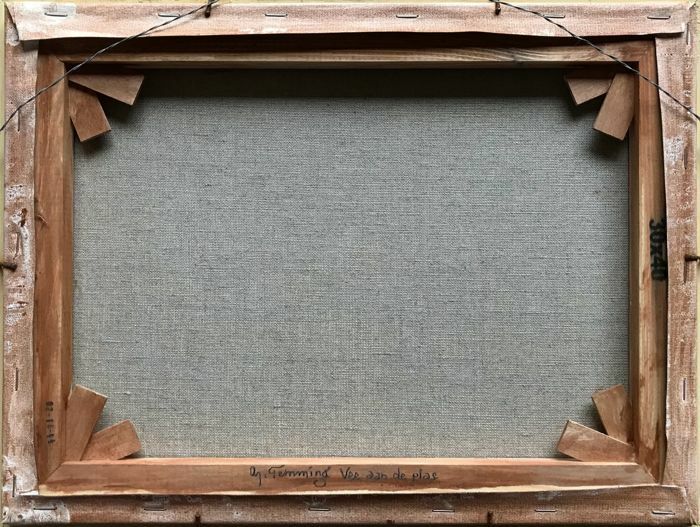 In a nice frame with the colours of the oil paint beautifully come back. 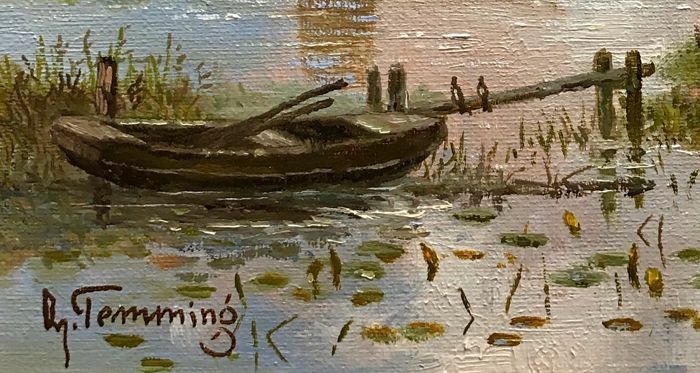 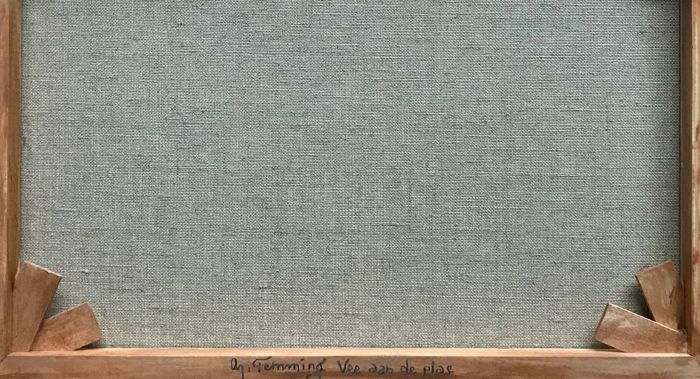 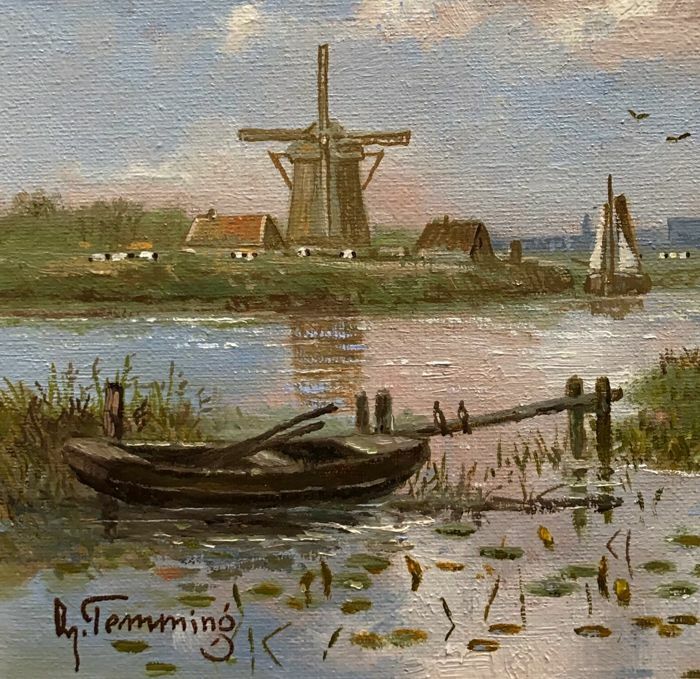 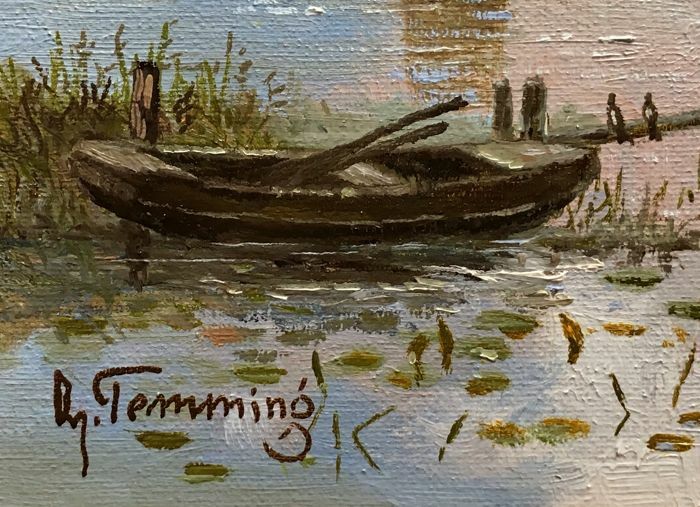 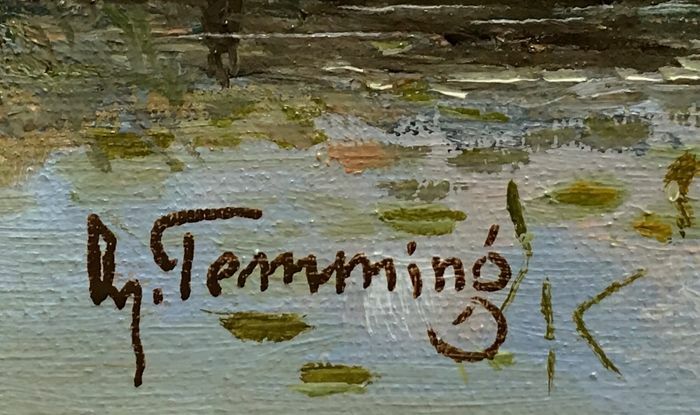 Albertus J. Temming was born on the 7th of September 1942 in Utrecht. 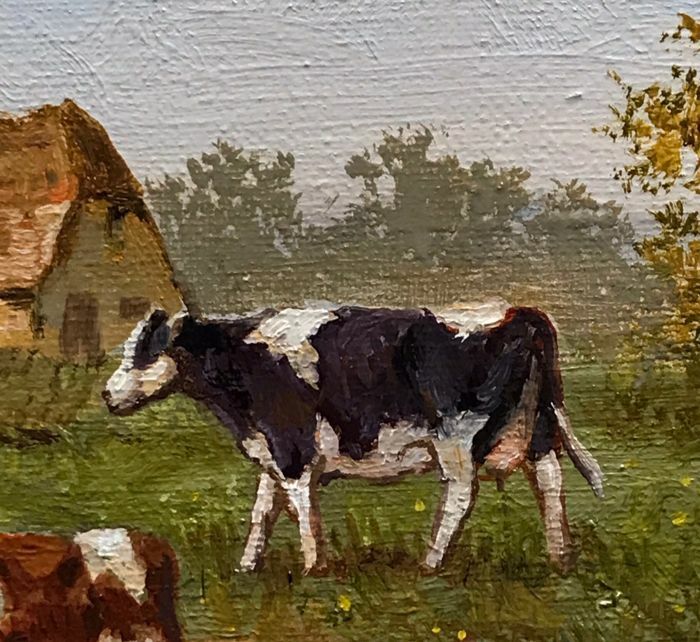 He has been painting since his youth. 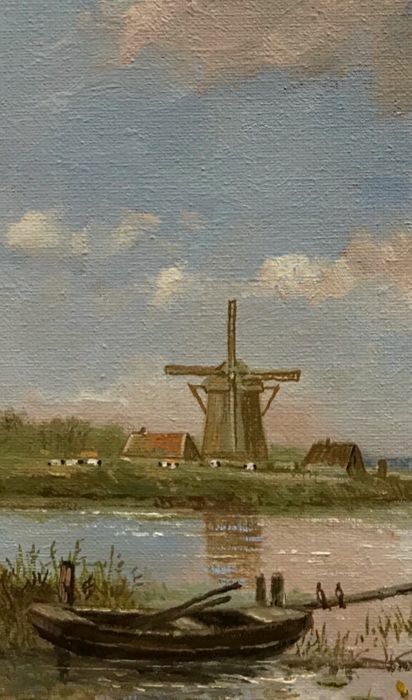 After attending the Artibus Art Academy in Utrecht, he evolved into a realistic artist. 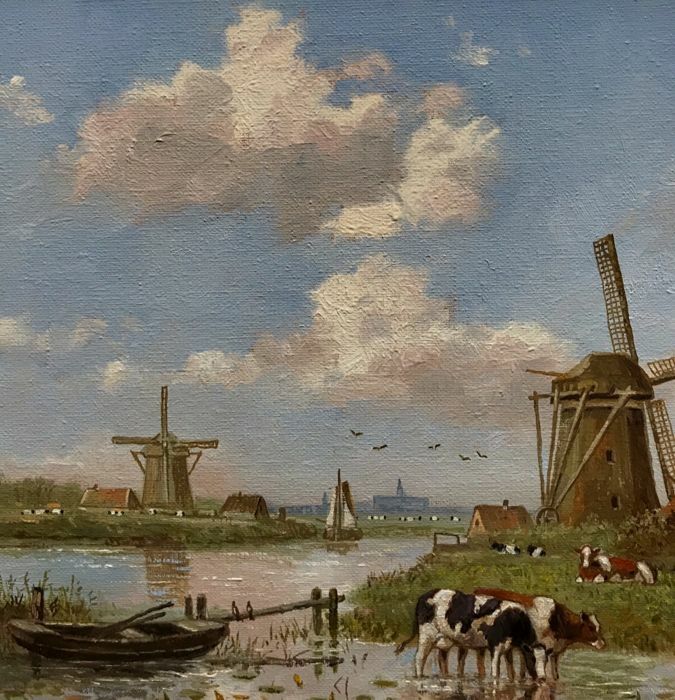 He is especially interested in landscapes, but city-scapes and still lives are also part of his oeuvre. 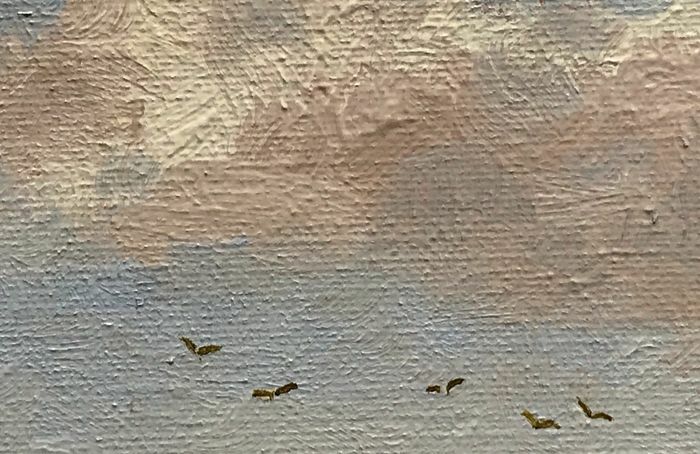 He also loves to paint winter scenes. 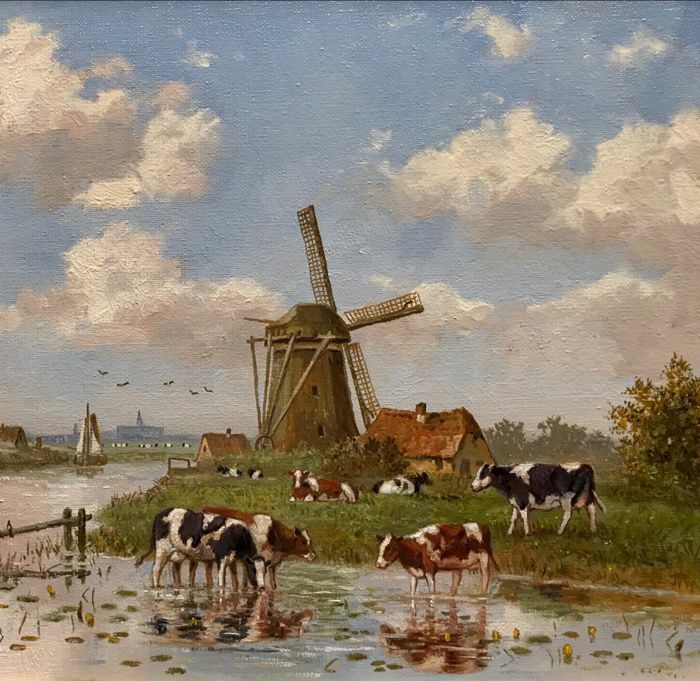 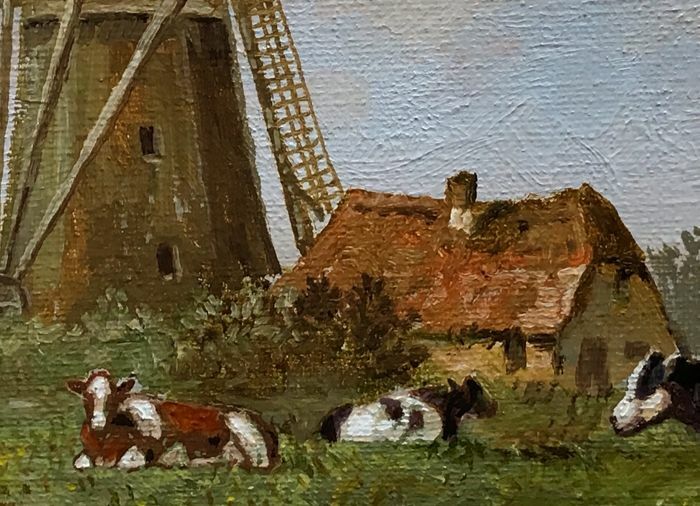 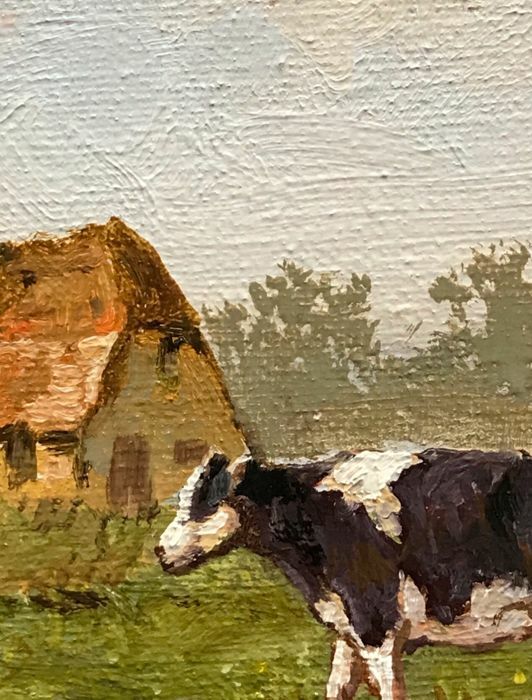 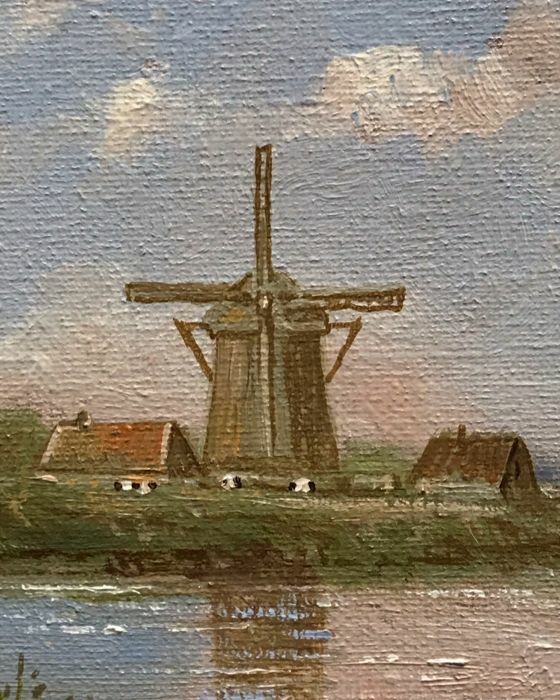 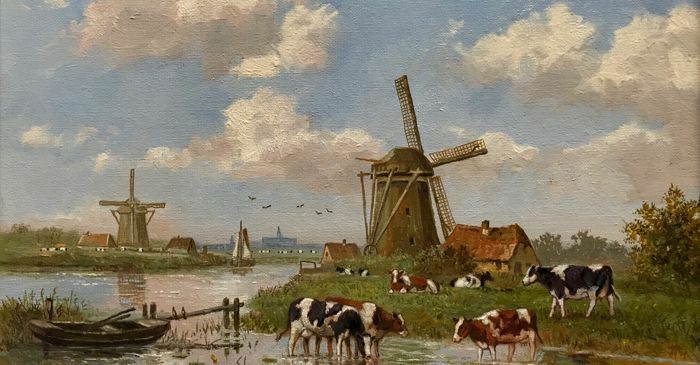 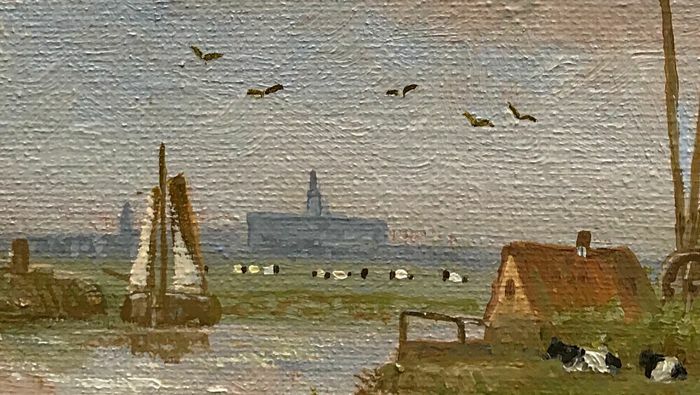 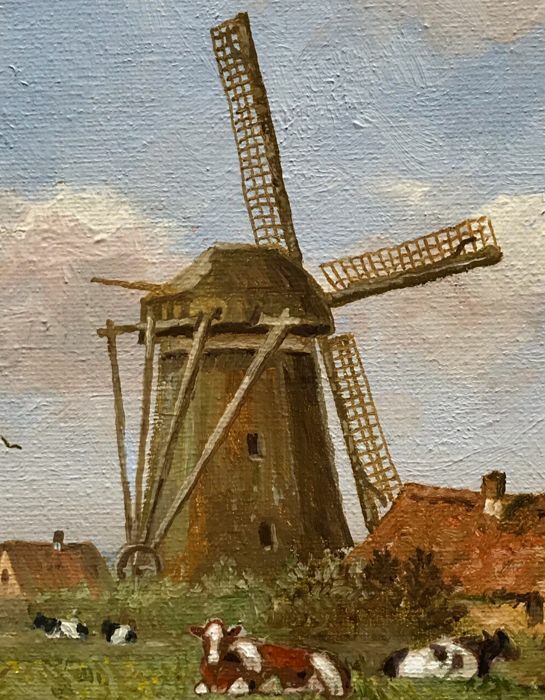 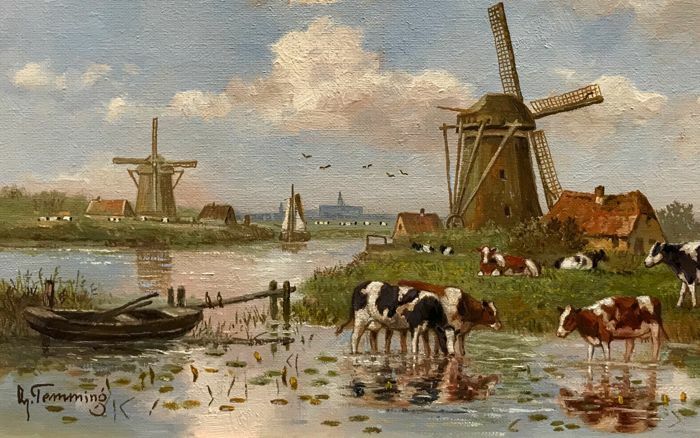 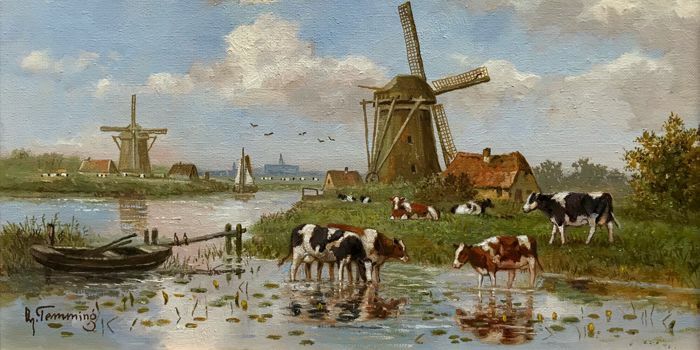 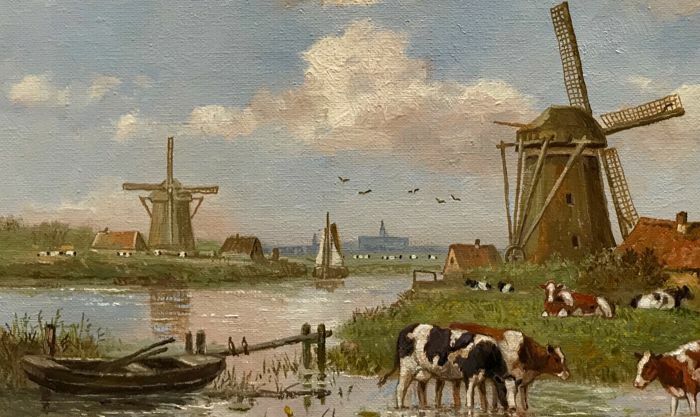 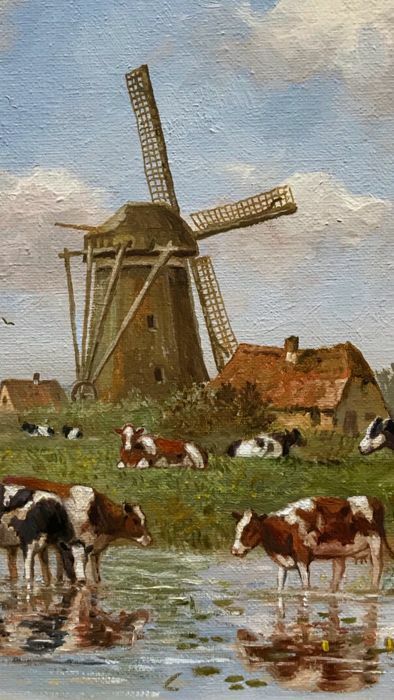 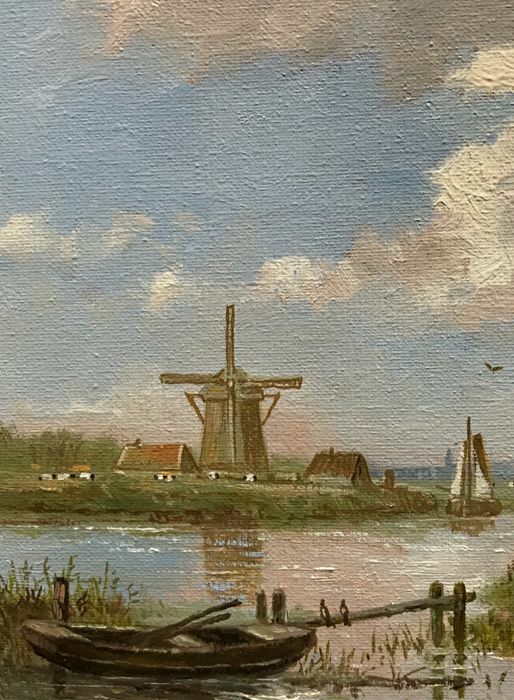 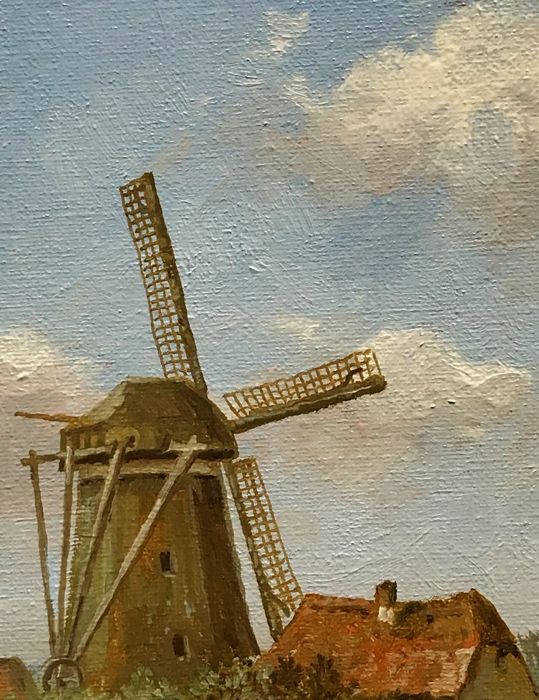 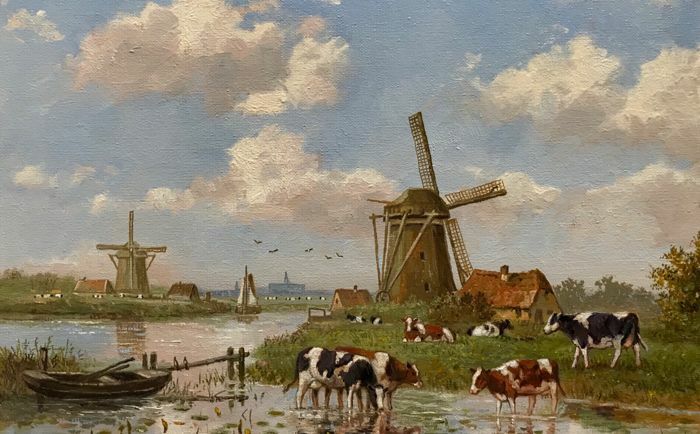 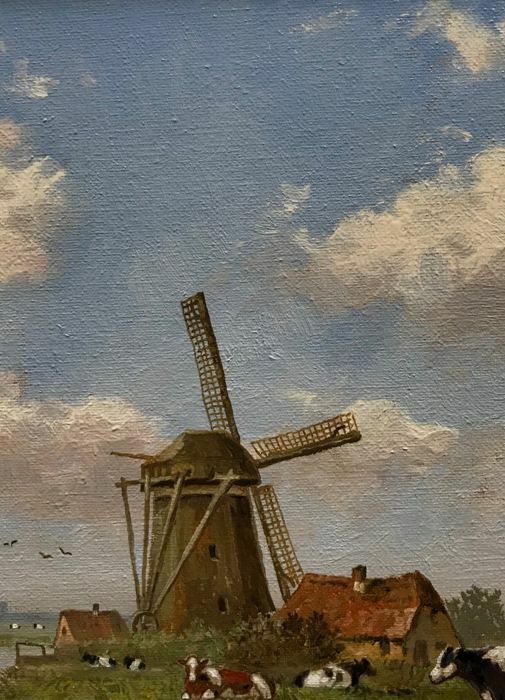 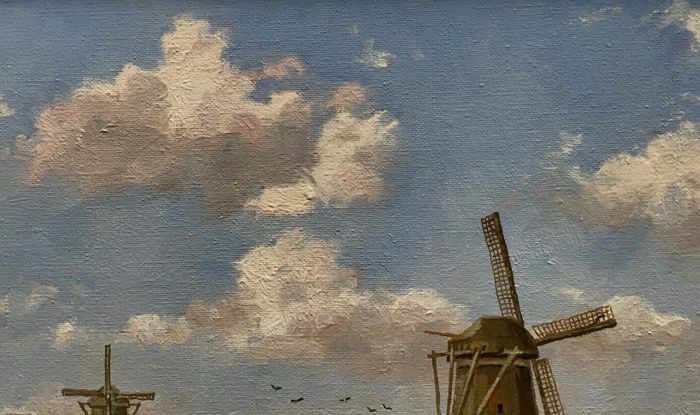 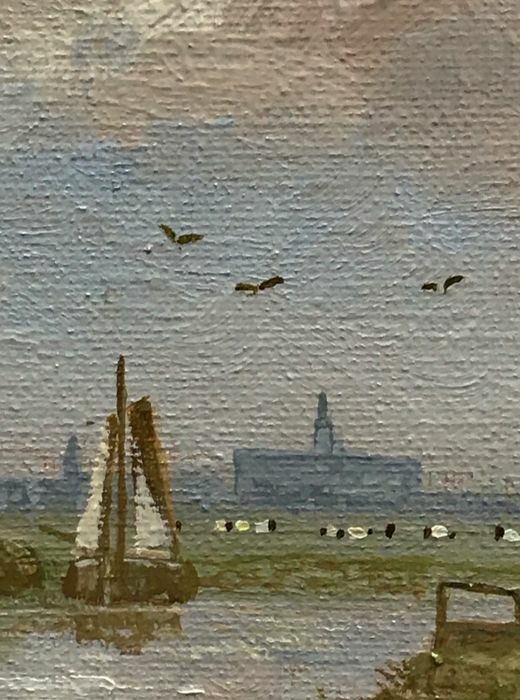 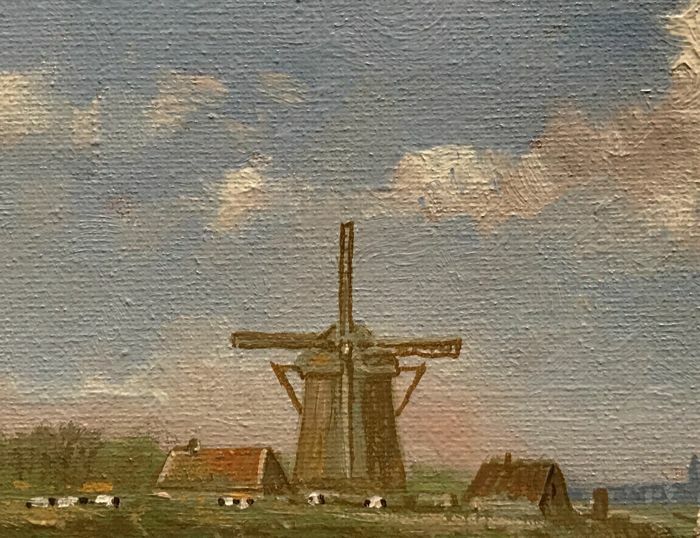 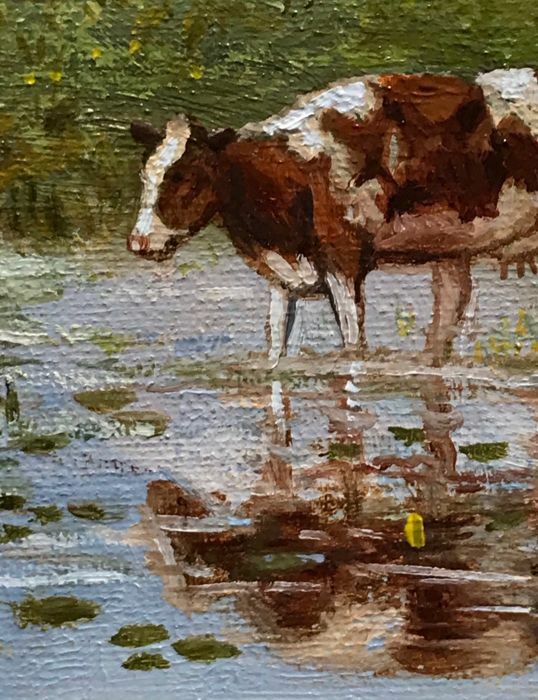 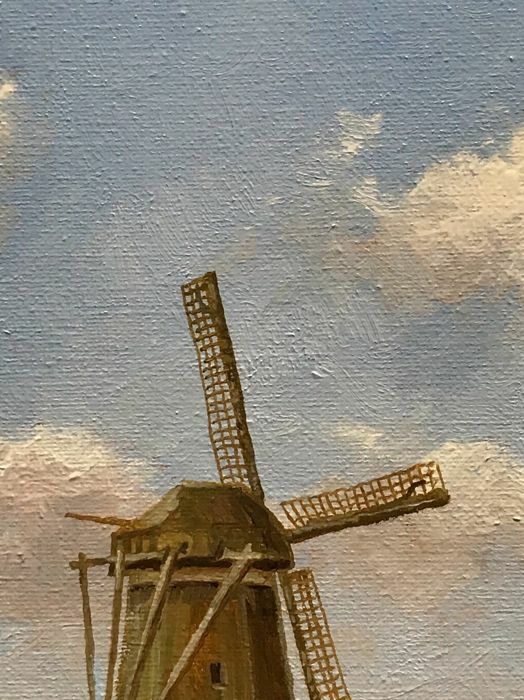 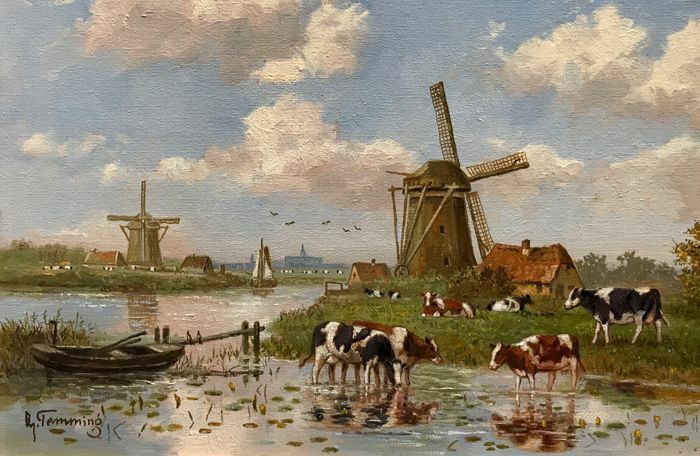 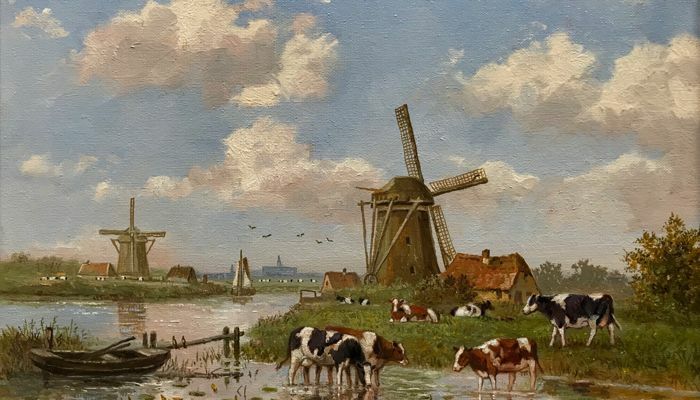 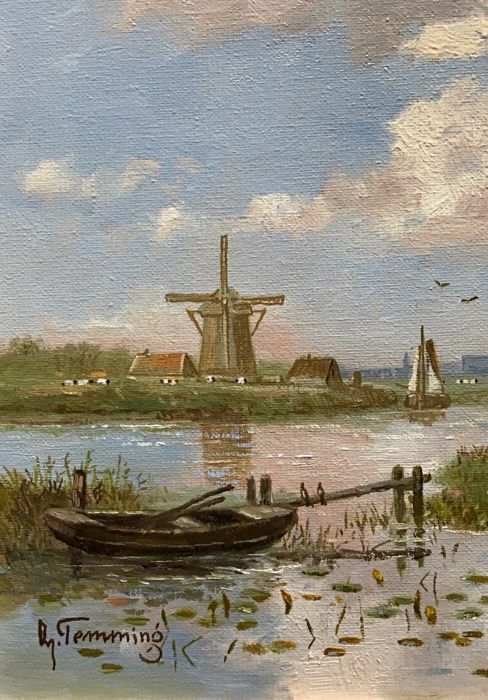 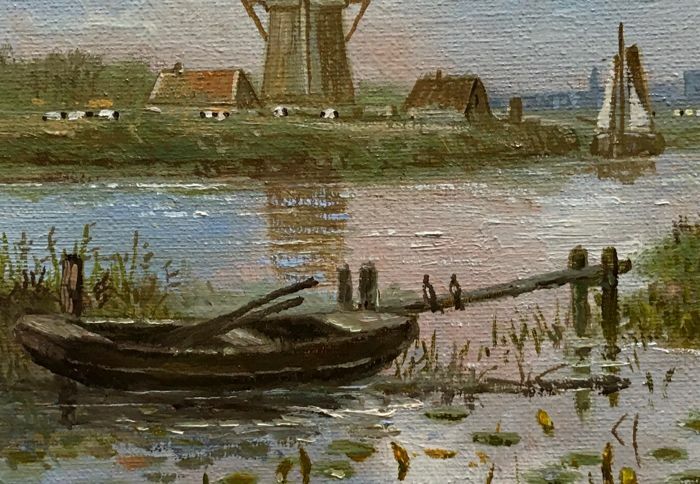 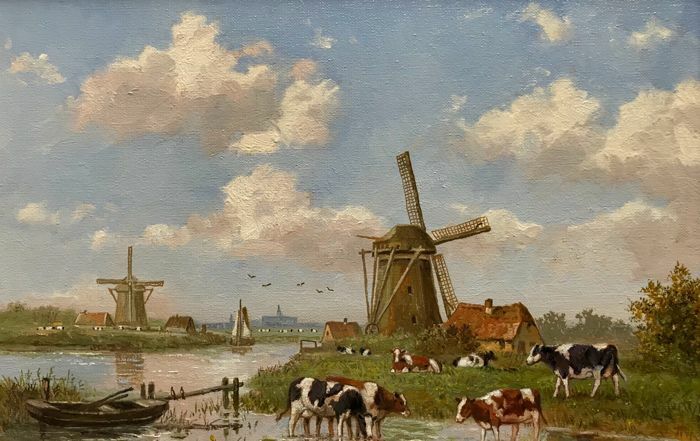 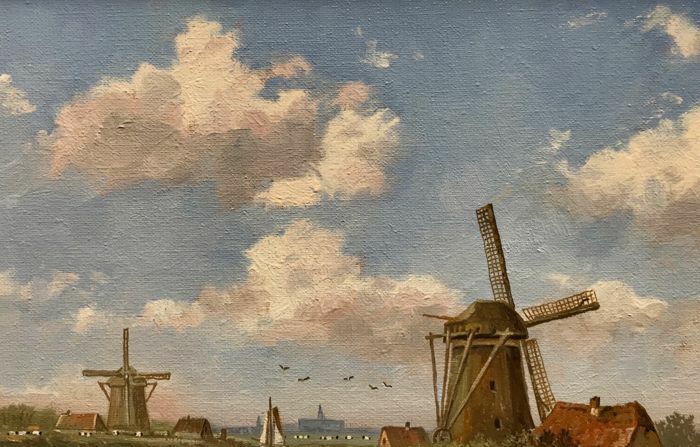 He lived across from the ‘Amelisweerd’ in Utrecht and has painted many cows in the rural Ouderijn area, near Rhijnauwen. 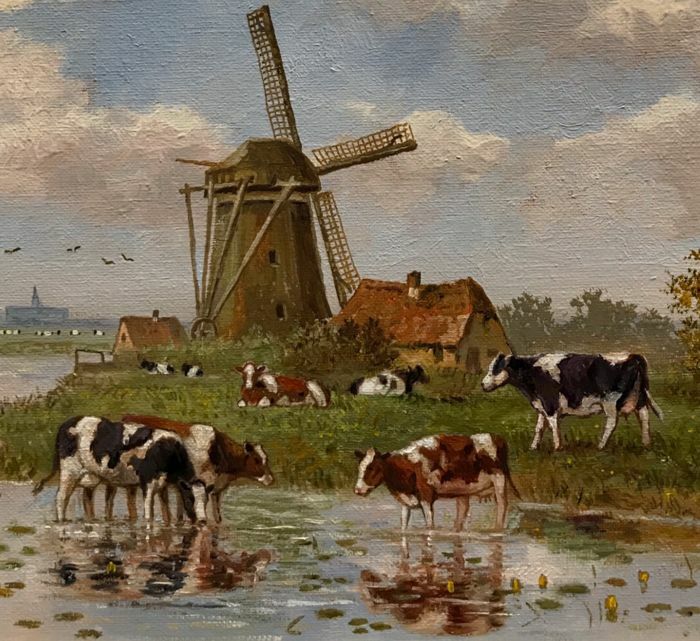 His oil paintings are on display in government buildings and castles. 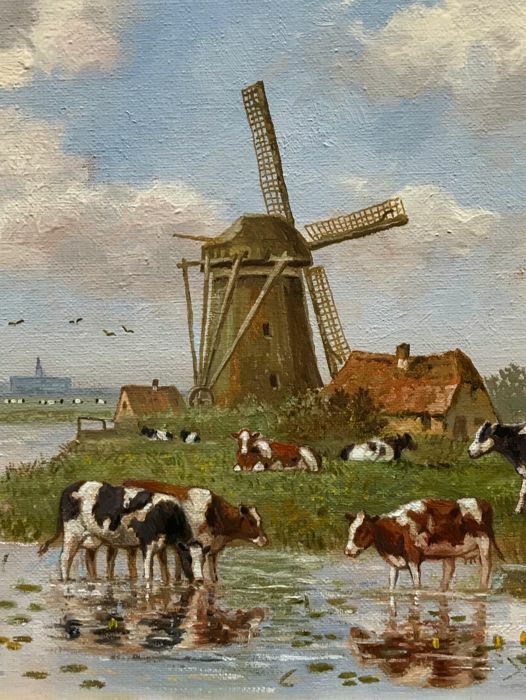 His scenes are very popular abroad. 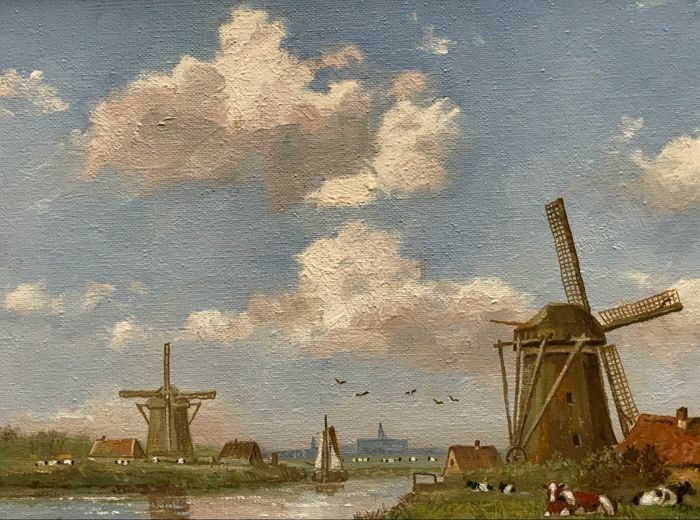 He was affiliated to Artibus, the Academy of Fine Arts of the province of Utrecht, and was a member of the “Kunstliefde” society in Utrecht. 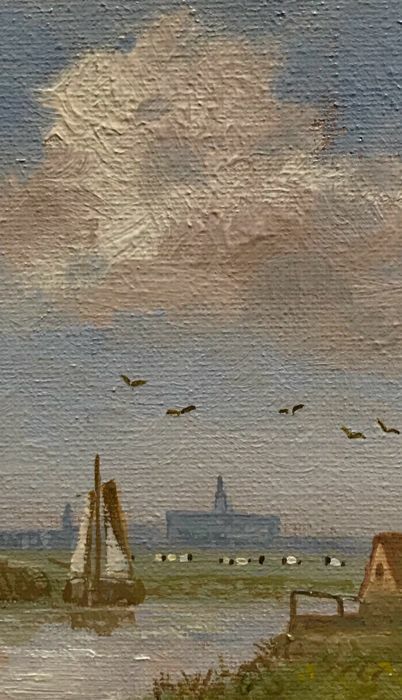 He is mentioned in the “Jacobs Schilderslexicon”. 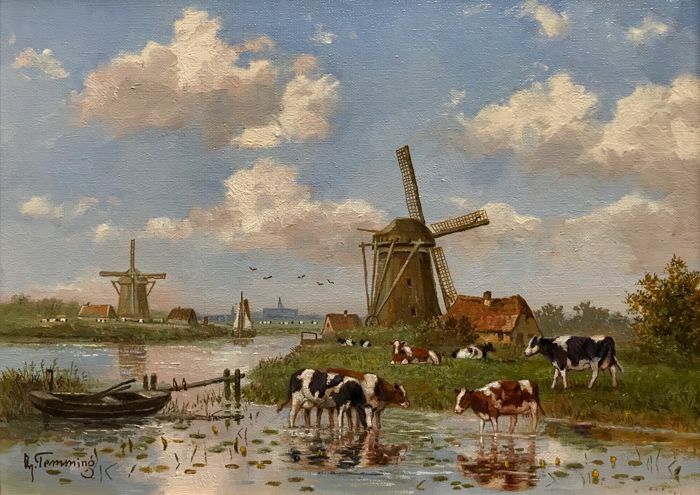 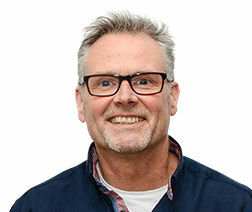 Exhibitions: Kunstliefde Utrecht, Rembrandt Utrecht, De Zwolsche Algemene Nieuwegein, De Kunstkliniek Hilversum, 't Gooiland Hilversum. 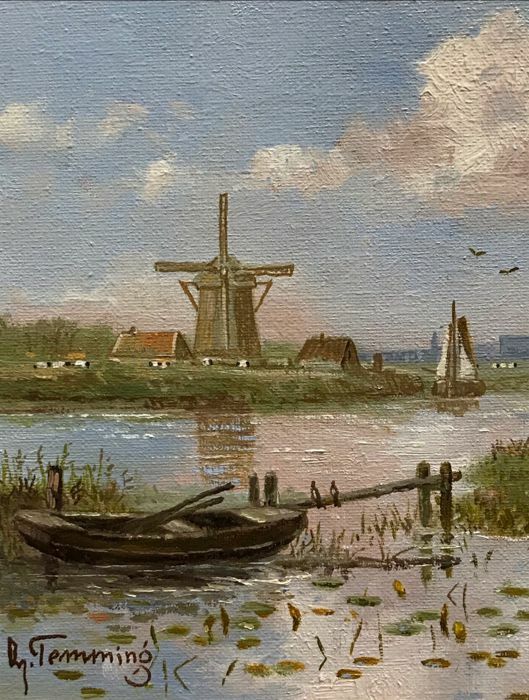 Will be packed with care and shipped fully insured.